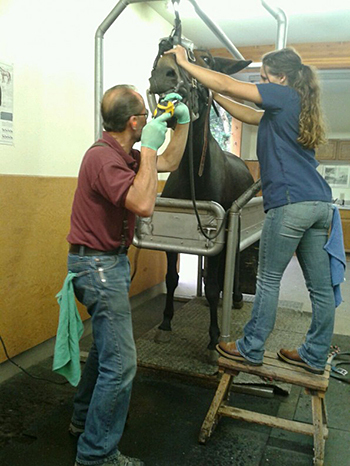 Equine dentistry has greatly changed over the last ten years. We have moved from hand floats to power floats and in doing so has allowed us to provide far better care for our equine patients that was never possible before. By performing dental procedures annually or bi-annually we have been able to retain and maintain teeth in equine well up into their thirties. Having proper dentition enables animals to chew and digest their feed properly allowing them to maintain better nutrition, body condition, as well as decrease pain. Animals that can’t chew their food properly are more subject to colic and loss of teeth and thus can be detrimental to the health of your animal.